Source of title proper: Title based on the names of the collectors. Cambridge: Harvard University Press, 1965, pp. 55-56.
original order, the papers were arranged into groups of Rossetti family members and non-Rossetti family members. For example, the letters ofRobert Browning and A.C .
Swinburne were not returned to Rossetti family groups to become incoming letters of Dante Gabriel Rossetti, William Michael Rossetti, etc. A manuscript by William North which was found in the papers, but seemed to have no relationship to the family papers, was arranged under a separate group, the William North papers. The same procedure was followed with the papers of other non-family members. 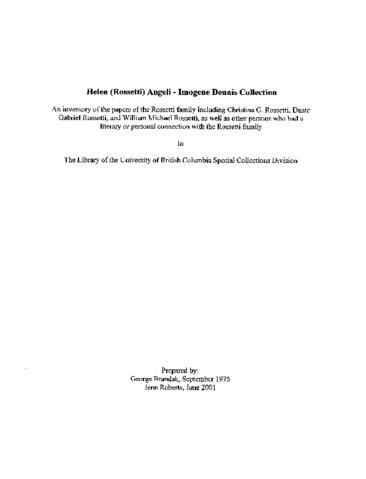 The Angeli-Dennis collection consists of the diaries (1855-1913), manuscripts, financial records and correspondence of William Michael Rossetti. Also included are the manuscripts, correspondence and financial records of Dante Gabriel Rossetti (1842-1882), Christina Georgina Rossetti (1853-1894), Ford Madox Brown (1852-1993), Gabriele Rossetti and other members of the Rossetti family. In addition, the collection includes materials of Robert Browning, Thomas Landseer, William North, Algernon Swinburne and James Thomson.